All GIS professionals have had to read metadata to determine details about the data. And some "lucky" users have had the opportunity to write the metadata. More often than not, this task is not addressed until the end of the project. Just when the end is near, someone usually chimes in with "What about the metadata?" Everyone dreads eleventh-hour metadata requests. They seem to get tougher every time: the first project required a last-minute Federal Geographic Data Committee (FGDC)-compliant file; the next project mandated completing all optional fields relevant to the dataset. Although few metadata authors are willing to admit it, many are guilty of fixing last-minute metadata requests and then immediately trying to develop amnesia for the entire painful process. The last straw for some might be attempting to use a profile they have never used before. The problem is that no one can predict the future or read minds. Not all the variables will be known until the data you are describing has been completed. When a template is not provided, a metadata author needs a crystal ball to figure out if what they write will be descriptive enough for a user. Excuses will always be plentiful, and writing metadata will always be one of the last steps to completing a project. It's time to stop developing excuses and start planning for last-minute metadata requests. 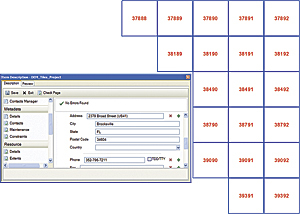 ArcGIS software's Item Description editor provides metadata authors with the ability to see the data relating to the metadata. A simple digital elevation model (DEM) tile layout is depicted while preparing a template for file-level metadata generation. The Metadata Contact Address section is active and is an example of a section that is predetermined and could be built into a government agency's template. For a governmental agency, standard language for the data's usage, distribution information, and contact information is probably predetermined, so why not create a metadata template that already has those fields populated? Templates are the most powerful tools to ease the anguish of last-minute metadata requests. They provide a method of introduction to new software interfaces. While the occasional new requirement will arise, existing templates may provide components of sections that will be the same. 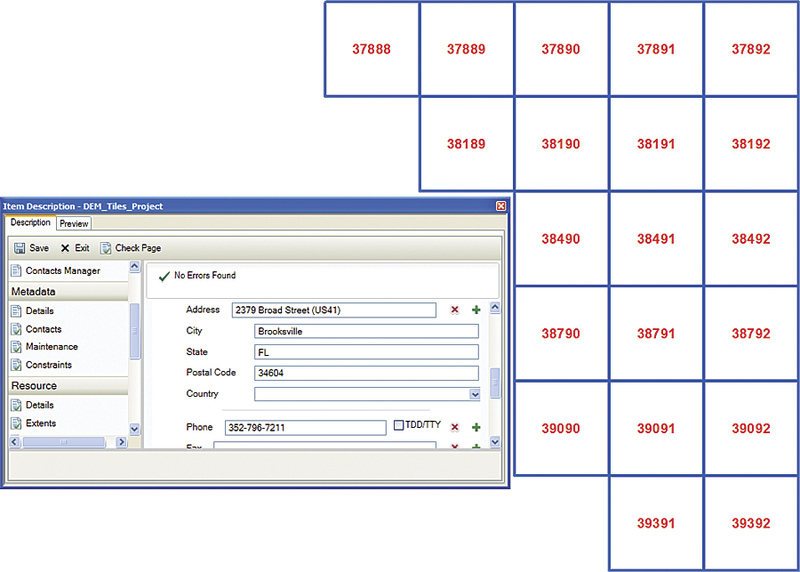 For example, projections that are frequently used within an organization can be quickly added. The Southwest Florida Water Management District (SWFWMD) held a metadata workshop with state GIS professionals and various mapping vendors. The workshop focused on developing an FGDC-compliant metadata template for orthophotos, but the same principles can apply to all types of data. In fact, SWFWMD used the orthophoto metadata template to develop a similar template for lidar. The group agreed on specific details that needed to be included in the abstract, source material, logical consistency, and process steps sections. Going through each of the sections allowed the group to decide on the best information that would benefit everyone. A template that could be distributed to any GIS firm was created; the result was a document that essentially allows users to simply fill in the blanks. When the metadata compiler opens the metadata template file, the information that needs to be populated is immediately evident. As a bonus, there is no need to worry about contact or distribution information, because this has been prepopulated in the template. Once a new profile has been accepted by an organization, a template is nearly complete. All that remains is the insertion of some form of tag or comment to denote a field that will need to be updated when the profile is used again. Also, with one round of reviews completed, an organization will have a better idea of how users are utilizing the information provided in the metadata. A list of elements that are frequently requested or potentially difficult to populate can be compiled. Most organizations will produce and document the same types of data on a recurring basis. Templates for each data type could be developed. For example, with orthophotos, it could be as simple as having a template for four-band, half-foot; three-band RGB one-foot; and three-band color infrared one-meter templates ready to edit. Having difficulties constructing the templates? That could be helpful! Learning more about the standard will facilitate better metadata completion. Therefore, it is best to obtain a copy of the metadata documentation to determine exactly which elements are mandatory and which are optional. Also, using an existing metadata file from your organization will help show what type of information is required and to what detail the metadata should be completed, or even perhaps what information is missing. Data stewards within an organization often receive many inquiries for information about the data. If there is a particular detail that is often requested, make sure it is included in the template. Of course, not everyone checks the metadata before calling or e-mailing, but at least having the details available gives the data steward a place to direct the user for more information. Working with the data users within an organization, as well as with the firm producing the data, to create a template is a win-win situation for everyone. It lets the organization identify all the information it would like within the metadata, and it saves the firm creating the data from looking into a crystal ball to determine its client's exact needs. Ms. Ryan E. Bowe, GISP, has been working at Photo Science, Inc., of Lexington, Kentucky, for six years as a GIS technician, as well as an alternate sensor operator. She has her bachelor of arts in anthropology and sociology from Centre College of Danville, Kentucky. April H. Davis, GISP, has been working at Southwest Florida Water Management District in Brooksville, Florida, for five years as a GIS analyst. She has her bachelor of science in geosciences from Mississippi State University and her master of science in geography from University of Florida. Both authors participated in the Department of Transportation Metadata Conference, and Davis led the Southwest Florida Water Management District metadata conference in which Bowe participated. For more information, contact Ms. Ryan E. Bowe (e-mail: rebowe@photoscience.com) or April H. Davis (e-mail: april.davis@swfwmd.state.fl.us). To learn about metadata creation and editing in ArcGIS 10, see esri.com/what-is-metadata.